Since we'll be using Ardour to record and edit sound, it might be useful to review how digital audio works. A diagram showing how sound travels through your computer. 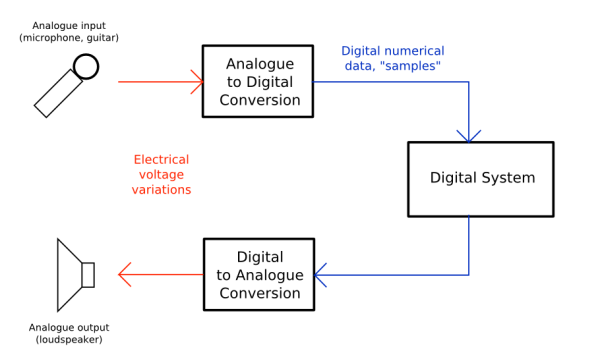 The "Analogue to Digital Conversion" and the "Digital to Analogue Conversion" are done by the sound card or audio interface. The "Digital System" in this case is Ardour. Imagine a loudspeaker. To move the air in front of it and make sound, the membrane of the speaker must vibrate from its centre position (at rest) backwards and forwards. The number of times the membrane vibrates each second determines the Frequency (the note, tone or pitch) of the sound you hear. The distance the membrane travels from its resting point determines the Amplitude (the volume or loudness) of the sound. Normally, we measure Frequency in Hertz (Hz) and Amplitude in Decibels (dB). A microphone works like a loudspeaker in reverse—vibrations in the air cause its membrane to vibrate. The microphone turns these acoustic vibrations into an electrical current. If you plug this microphone into a computer's sound card and start recording, the sound card makes thousands of measurements of this electric current per second and records them as numbers. The number of Samples (i.e. measurements) made per second is called the Sample Rate, and the number of possible values each Sample can have is called the Bit Depth. The combination of Sample Rate and Bit Depth indicates how closely the digital signal can reproduce the sound it has recorded. When Ardour displays the Samples which have been recorded, they appear as the Waveform we see below. The centre horizontal line indicates the membrane of the speaker at rest, and the Peaks of the Waveform indicate the maximum Amplitude. If we take the same Waveform and increase the Amplitude by 6 Decibels, then some of the Peaks will now be outside the range that the computer can represent digitally. The computer's inability to represent Peaks outside the range of Amplitude is called Clipping, which results in a permanent loss of digital information, as well as a change in the sound quality which is recognizable as Distortion. Ardour marks clipped Peaks with the color red, as can be seen in the image below. In both images, one can also see the Mixer Strip on the far left, which gives a running measurement of the Peaks, as well as an indication at the top of the Peak Meters showing the maximum Peak so far. The range of decibels between the region's maximum peak and the clipping point is commonly referred to as Headroom, and common recording practice is to keep approximately three to six Decibels of Headroom between the maximum of your signal and the clipping point, with the clipping point itself being represented as 0 dB (zero Decibels). In other words, an audio region with a comfortable amount of Headroom would have its maximum peaks between −6 dB and −3 dB. Also, because the Peaks of audio signals add together, care must be taken when Mixing several sources together to keep the combined signals from Clipping. To make audio playable on a compact disc, for example, the computer must generate 44,100 Samples per second. The Sample Rate determines the highest frequency which can be recorded or played back by the computer. A sampling rate of 44.1 kHz means that the highest frequency which can be represented is just under 22.05 kHz. Since normal human hearing lies within the range of approximately 20 Hz to 20 kHz, this is commonly accepted as a reasonable Sample Rate. Other commonly used Sample Rates include 48 kHz (DAT recorders) or 96 kHz (DVD audio). Each Sample is recorded as a 16-bit number. One Bit is a piece of information which is either 0 or 1. If there are 16 bits together to make one sample, then there are 216 (65,536) possible values for each sample. Thus, we can say that CD-quality audio has a Sample Rate of 44.1 kHz and a Bit Depth of 16 bits. Professional music recordings are usually mixed using 24 bits to preserve the highest amount of detail before being mixed down to 16 bits for CD. Older computer games have a distinctively rough sound, using only 8 bits. By increasing the Sample Rate, we are able to record higher sonic frequencies, and by increasing the Bit Depth, we are able to use a greater Dynamic Range (the difference between the quietest and the loudest sounds possible to record and play).